It’s that time of year when there doesn’t seem to be enough time. The tizzy of back-to-school here in Gainesville leaves many of us struggling to find the time to cook and prepare healthy, delicious meals for our families. It seems like preparing healthy meals is the last thing on our list and often falls by the wayside. Here at Ward’s Supermarket, we love supplying our customers with the best bounty our local farmers have to offer. We know that it may be a challenge to set time aside to shop and prepare healthy meals, but we think it’s worth the effort. We’ve compiled our six best tips to consistently put delicious and healthy meals on the table this school year, to help keep you and your family well fed and energized! If you don’t have one already, an instant pot may quickly become your new best friend! Instant Pots (or pressure cookers) have the ability to cook a meal like a pot roast or whole chicken in a fraction of the time it would take in the oven. This is because Instant Pots have the ability to raise the boiling temperature of water, cooking the food much faster. Bonus: cooking with one generally doesn’t heat up the house! With a little chopping and prepping, you can throw everything in your Instant Pot and have a home-cooked stew, chili, or sloppy joes made in 30 minutes or less! Another trend we’ve seen lately is the popularity of sheet pan meals. The beauty of this system is that it makes a lot of food in one shot, and you probably already have a few sheet pans lying around in your kitchen right now! Sheet pans do require some degree of prepping and chopping: buying the ingredients, chopping vegetables, and preparing marinades or sauces. But once you’ve prepared, all you need to do is throw everything on a few sheet pans and toss them in the oven! At Ward’s, we always have seasonal vegetables in stock, so you’ll never get bored of the same vegetables in your sheet pan meals. Some great options for sheet pan dinners are broccoli, squash, onion, potatoes, carrots, and asparagus! There’s one thing on every chef’s list of pain points: chopping. Unless you’ve been trained in a culinary school to chop vegetables like a pro, chopping can be a little bit of a time-sink. But the good news is, there are many tools you can use to speed the process up. Items such as a mandolines, food processors, spiralizers, and immersion blenders can all make quick work of vegetables. The best advice we have here is to carve out an hour or so to chop your vegetables for the week. Once your vegetables are all chopped, that makes assembly and cooking that much easier! We admit, “dump meals” doesn’t exactly sound appetizing. But the concept of dump-and-go meals has taken its place among the best meal prep ideas out there. This method involves taking the ingredients for a meal and placing them in a plastic bag or container. Once you’re ready to cook, you simply “dump” the meals into a slow cooker and let them cook while you’re away. It really is a convenient option for busy families and takes the stress out of the “what’s for dinner” question. As long as you have the freezer space, dump meals are a great option for meal prepping! Combine fresh and local ingredients from us with some of these popular dump meals, and you’ve got the recipe for a crowd-pleasing, easy, healthy, and delicious meal! Vegetables – If you buy fresh vegetables on sale in bulk but don’t use them right away, you can chop them up and store them in the freezer for future use. Sign up for our weekly specials email so you don’t miss a deal! Quinoa or Rice – Quinoa and rice are used in many dump meal recipes, but also can be used as a side dish in many sheet pan meals as well. You can find a variety of options in our Bulk Goods section to stock up! Shrimp or Salmon – Frozen fish makes a great meal prepping ingredient as they thaw quickly. Stock up during one of our weekly sales and freeze the rest for future use! Broth or Stock – Broth makes a great addition to any dump meal and adds a lot of flavor to rice or quinoa. In our store, we have a few options such as stock and bone broth. We have locally produced refrigerated bone broth from The Nourished Path ($11.99/32 oz, beef or chicken). We also have an excellent variety of cartons of broth and stock, as well as a staff favorite, “Better Than Bouillon” broth concentrate in many flavors- 1 teaspoon makes 1 cup of broth! Oatmeal & Beans – Both of these items are great to have on hand for meal prepping. Oatmeal makes a great breakfast option, and beans can be used in chili or soup recipes. These items can also be bought in bulk in our Bulk Goods section. Salsa, Sauces, and Spices – Meal prepping is one thing, but making sure your food tastes flavorful is important too! We offer a wide variety of spices in our bulk good section, locally produced salsa from El Toro, and Southwest simmering sauces from Simply Organic. These are perfect for no-stress taco or fajita nights! When you think of your muffin tin, you often think of delicious baked goods such as cupcakes or muffins. But a muffin tin is much more versatile than you might think! These meals are great for the kids – you can make them in large batches, they are highly portable, freezer-friendly, and perfectly portioned! You can make any sort of meal in these amazing muffin tins: breakfast, lunch, dinner, desserts, and snacks! Some ideas for muffin tin meals are egg breakfast cups (with veggies), lasagna cups, turkey meatloaf, breakfast granola cups, and more! 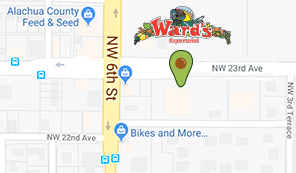 Find Your Meal Prep Ingredients at Ward’s! If these meal prep ideas have your wheels turning (and your mouth watering), then stop by Ward’s to find all you need to prep some quick, easy, and healthy meals! You’ll find lots of local and fresh produce options in our produce section, locally raised beef and pork in our meat department, and spices and grains in bulk in our bulk goods section. Don’t have time to stop by? No problem! We’ve partnered with local grocery delivery service, Marketplace Delivery, to have all of your favorite Ward’s pick delivered right to your door! Give them a call at (352) 261-0128 to place your order! Keep you and your family well fed and thriving with these meal prep ideas, and we hope to see you in store soon!